When you want or need to have BatchPatch execute scheduled tasks even if the BatchPatch computer is not logged-on and/or you have not launched BatchPatch, the BatchPatch ‘run-as-service’ feature enables you to install BatchPatch to run as a service. You can then run any grids in this service instance so that the scheduled tasks defined in those grids will be executed regardless of whether or not anyone is actually logged on to the BatchPatch computer. This has obvious benefits. For more information on setting up and utilizing the service instance, please review this link. Under normal operating circumstances it’s very quick a painless to install and operate the service using the default installation parameters. 99% of users will be able to do this without issue. The service will install and operate without any problems on an unmodified fresh installation of Windows. However, occasionally we hear of a user having issues where the service appears to install successfully, but in the Windows Services console it gets stuck in the “starting” state. We have identified the following possible causes for this situation. Service runner account has never logged on: If the account that you are using to install the service has never logged-on to the computer before, that could be the source of the problem. Make sure that you have logged on to the computer at least one time with the user account that will be running the service. If you use right-click run-as to run BatchPatch as a different user account from the account that you are logged-on to the computer with, make sure to log on to the computer separately with the run-as account one time. After you have logged on with the runner account once, you may switch back to the other account and then continue using right-click run-as to launch BatchPatch as the runner account without being logged on to the computer with that account. Launching BatchPatch from inside a .zip file: Make sure that you are not running the BatchPatch.exe directly from inside the BatchPatch.zip file. Please first extract the batchpatch.exe to a location on disk using the .zip extraction tool of your choice, and then double-click the batchpatch.exe to launch it. Do not simply “open” the batchpatch.zip file and double-click the batchpatch.exe without first extracting the batchpatch.exe to a new location on disk. If you launch BatchPatch directly from the unextracted .zip file and then proceed to install the service, it could create a situation where incorrect or unexpected permissions prevent the service from starting successfully. 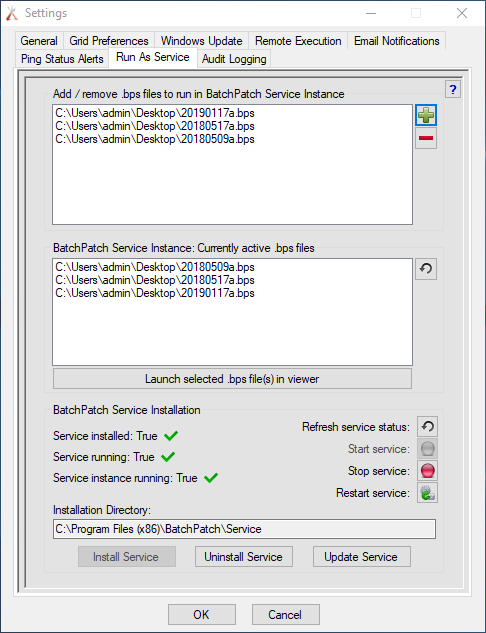 Permissions issue with service installation location: The default location for the installation of the BatchPatch service is ‘C:\Program Files (x86)\BatchPatch\Service’. If you find that the service is stuck starting, it could be due to unexpected or unusual permissions being applied to that folder. In this case we recommend uninstalling the service and then attempting to reinstall it using an installation directory that’s inside the user profile for the user running the service (e.g. if ‘SomeUser’ is the service runner account, then install the service in ‘C:\Users\SomeUser\BatchPatch\Service’ or similar location). It might be the case that modifying the permissions on the original ‘C:\Program Files (x86)\BatchPatch\Service’ directory would also fix the problem, so long as the service runner account has full read/write access to that directory. Both options are probably worth trying to see if one works for you. Service runner account is not local administrator: Make sure the service runner account is a member of the local administrators group on the computer. Membership in the local administrators group may not be required for the service to run successfully, but it’s the first best thing to try if you are having problems trying to run the service with an account that is not a member of the local administrators group. If you can get things working properly with the account in the local administrators group first, then you can work from there as a starting point if you still want to run the service without local administrator permission, in which case you would still need, at the very least, to grant the runner account the ‘Log on as a service’ security policy setting. If you discover a different cause for the service getting stuck in the “starting” state on your computer, we would really appreciate if you could please reach out to us to let us know, so that we can update this posting accordingly. Thanks! This entry was posted in Blog, General, Tutorials and tagged service, starting, stuck. Bookmark the permalink. Both comments and trackbacks are currently closed.